The April draw of the Werrington Lottery took place at the Washerwall Lane Co-op by Kevin Minor. The winning number was 155. You have to be in it to win it and if you would like to know more about the Werrington Lottery which raises funds for village projects call 01782 303192. 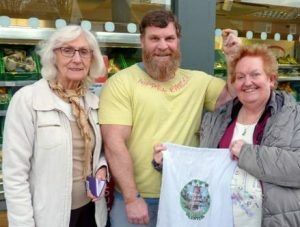 Our photograph shows Community Volunteer Jean Fryer with Kevin and Lottery Organiser Jocelyn Morrison. The lottery is now based at the Werrington Community Library & Wellbeing Centre where you can also get an entry form.